Bed bugs are a common problem very few people know much about. Anyone can get bed bugs, even in the cleanest environments. They are parasites that can have a negative affect on sleep, hygiene, and health. People can react to bed bugs differently, but the first sign is often small bites that become inflamed and itchy, like ant or mosquito bites. If you think you may have bed bugs, start by inspecting the bed, including the mattress, box spring, headboard and frame. If you have a bed bug infestation, approximately 70% or more of the bed bugs will be found here. Spotting an actual bed bug is likely, but is not always the case. Another 23% will be found in furniture within 5 feet of the bed or in upholstered furniture. Check under and behind night stands, as well as piping and pleats of upholstersd furniture. The other 7% will disperse to other areas such as base board cracks, wall hangings, curtains, and other furniture. 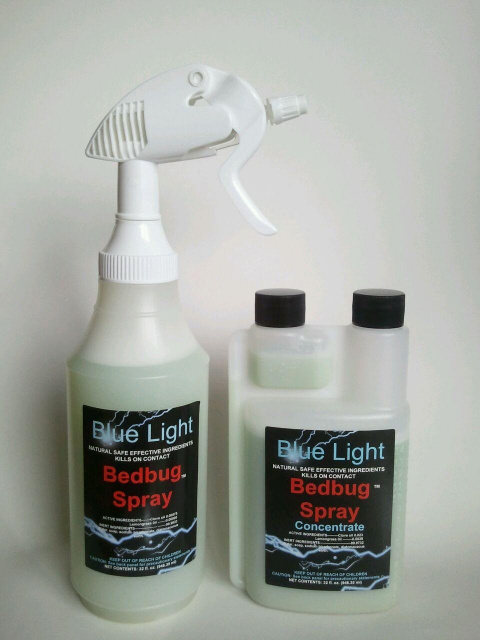 Apply Blue Light Bedbug Spray as a crack and crevice spray (rotate spray nozzle) to bed frames, box springs, inside empty drawers and close closets, night stands and other furniture in the room. Spray floor molding crack and crevices and where carpets and walls meet, and other areas where bed bugs and their eggs may be found.